For many, the idea of traditional orthodontics just isn’t attractive. Metal braces can be uncomfortable, unappealing, and interruptive, and even if your smile’s crookedness is impacting your appearance or oral health, you might hesitate to opt for orthodontic treatment. With Invisalign, though, you can reconsider. Invisalign clear braces offer a completely different way to straighten your smile – nearly invisible, smooth, removable, and comfortable. If you’ve always believed that the smile of your dreams was out of reach, think again; consider Invisalign clear braces from Cowlitz River Dental in Castle Rock, WA. We’ll assess your smile and plan out your treatment using advanced technology that can then design the series of clear braces that you’ll wear throughout the process. You begin with one aligner, and a few weeks later, you change to the next one in the series. This is how Invisalign gradually changes the shape of your smile. 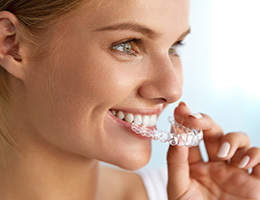 For those who like things to be simple, Invisalign is a good choice for orthodontic treatment – it really is that easy! The Invisalign clear braces aligners are removable, which gives this orthodontic treatment certain advantages. It’s easier to clean your teeth; you can simply take out your aligner and brush and floss as you always have. Removable aligners also make it easy to look your best for big events – even though Invisalign are nearly invisible, there may be times when you simply do not want to wear the aligners. While you should wear them most of the time, you can remove them for a first date or a big work event with no problems. Six Month Smiles work differently and can handle different alignment problems. Call Cowlitz River Dental in Castle Rock, WA for an appointment to see which method might be best for you. Ready to straighten out your smile? Contact Cowlitz River Dental in Castle Rock, WA. Serving individuals from local and surrounding communities in southwest Washington and northwest Oregon, we make it easy with Six Month Smiles and Invisalign clear braces. Dr. Kennington is committed to helping create beautiful, straight smiles for patients.